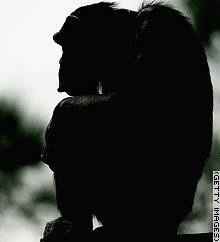 Chimpanzees may have been using stone “hammers” as long as 4,300 years ago, an international research team, led by archaeologist Julio Mercader of the University of Calgary, Canada, said Monday. The researchers uncovered the hammers, in the West African country Ivory Coast. It would be the earliest known use of tools by chimpanzees. The hammers were used to crack nuts, a behavior still seen in chimps in that area, the researchers said in a paper in the online edition of Proceedings of the National Academy of Sciences. The finding may indicate that a “chimpanzee stone age” began in ancient times, the researchers say. The earliest reports of stone tool use by chimpanzees in this area date to the writings of Portuguese explorers in the 1600s. The stones were about the size of cantaloupes with patterns of wear indicating use to crack nuts. The rocks would have been too large for human hands, but about right for the larger, stronger hands of chimpanzees, the researchers said. “It’s not clear whether we hominins invented this kind of stone technology, or whether both humans and the great apes inherited it from a common forebear,” Mercader said in a statement. But, he added, there were not any farmers living in this region 4,300 years ago, so it is unlikely chimpanzees picked it up by imitating villagers.